What’s Different About Our Softeners? Why Use a Salt Free Solution? Minerals in the earth naturally blend and dissolve into our water as it travels beneath surface of the earth. When these levels reach a certain point we consider the water to be hard (just a saying, the water is not physically hard like ice). If you are just learning about magnetic water conditioning, you may want to visit our Softener FAQs page to learn more. For pools, wells, or hot tubs, you can see treatment examples here. These install in minutes with no tools… see how easy installation is here. Our water softeners are designed to focus the magnetic field through the pipe and therefore through the water. This alters the way the hard water molecules behave. Their tendency to want to clump or stick together is greatly reduced and so is their tendency to stick to physical objects like pipes, faucets, and glass. At the same time, the surface tension of the water is altered in a positive manner. If you have experienced hard water, you probably noticed that the harder the water is… the less soapsuds are created. This is usually the first noticeable difference after installing a set of magnetic softeners. Increased suds will mean you need to use less dish soap, laundry detergent, shampoo, and any other cleaning agents that create bubbles. How long will it take to reverse the effects of hard water? We have no way of knowing how much scale build up you might have in your water pipes. Obviously, a new home would have none and if you used our units from the time the home was new you would never get significant scaling. On the other hand, if your home is 20 or 30 years old with the original plumbing, it could take a year or more to remove all the scale from the inside of your pipes. It took a long time to build up, so it will take some time to get rid of it. That is why we give you a full year to try our system and decide if magnetized water is for you. We also make it hassle-free to return them for a full refund for any reason. Unlike others in our industry we do not charge a restocking fee, we do not charge you if they are not in like new condition, you do not have to call us for an authorization number, and if you call, we do not try and talk you out of returning them. Our calcium fighting softeners are proudly made in USA (check out our American Made page), and have been reasonably priced since 1996. There are no middlemen and no multilevel marketing, so no artificially inflated prices. We are open seven days a week and our hours and phone number is posted at the bottom of each page of this website. If you have any questions you can take a look at our Softener FAQS page to see if we have addressed it there, but if you can not find your answer there… please feel free to call us and discuss your specific situation. It’s not an inconvenience for us… we would be happy to speak with you because we remember how many questions we had when we bought our first set back in 1989. For additional information and actual photos of the effects of treatment visit Science Direct for an article that includes this before and after microscopic view, and this description… Electron micro-graphs of carbonate deposits from untreated (left) and magnetically treated (right) mineral water. There are not any non-chemical conditioners that will produce the same slick feel of a traditional salt water conditioning systems. These salt based units (the kind we grew up with) create what we commonly refer to as soft water. If you switch from a salt softener to a magnetic water softener, you may be disappointed, because your results would seem like a step backwards for you. If, on the other hand, you have untreated hard water and add magnetic softening, you will likely be very happy with the results, because it is a step up for you and increased suds in the shower, laundry, and kitchen sink would probably be the first thing you would notice. The force applied by our units can change the behavior of your water as it passes through the high flux field. As a result, the calcium and lime and other minerals are not nearly as attracted to the the walls of the pipe or the inside of your fixtures. Then the minerals can continue to flow back into the earth through your drainage system. Humans, pets, and plants can all make better, more natural, use of the minerals in the water they consume. We believe that the products we build are the finest available today, and they work in harmony with all filtration systems! Please Note: Some think these units are magnetic water filters… they are not filters at all. We Developed Two Levels of Water Treatment! 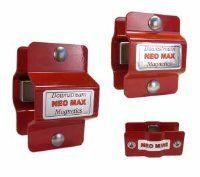 Since most people have individual needs and different levels of hardness, we developed 2 lines of magnetic softeners. Recommended for use when there is no visible scale build up on the plumbing fixtures in your home. These magnetic water softeners are designed for extreme hardness (20-60 GPG), as well as for commercial and industrial applications. We recommend these when there is visible white scale build-up on your faucets and shower-heads. They come in 3 different sizes for water lines from 1/4″ to 2 1/2″ in diameter. There are three standard measurements for what we know as hard water; (PPM) or Parts Per Million, (MGL) or Milligrams Per Liter, and (GPG) or Grains Per Gallon. The formula for converting PPM or MG/L to GPG is to divide PPM or MG/L by 17.1. One PPM = 1 MG/L. 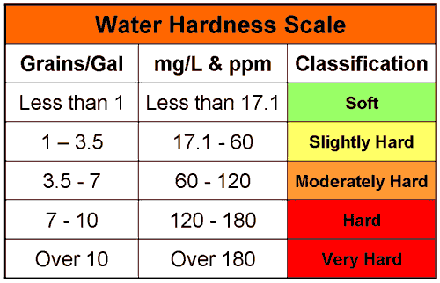 Below is a simple chart showing the ranges of hardness according to the United States Department of the Interior. To find out the hardness of your water, simply contact your local city or county utility department. They will have a good idea what the level of hardness is in your area. Then chose the right set for your specific situation. Take up to a year if You Need to… putting Us to the test! We are so sure our magnetic water conditioners are the finest available, anywhere at any price – that we will give you something no other company offers – the strongest return policy in the entire industry! Order your set today. Try them for up to an entire year. If you are not 100% convinced they have worked as promised just send them back. We will refund your money (no questions asked)! Our Eco Friendly Magnetic Water Softener Systems Will Save You Power, Salt, Resin, and Hassle!